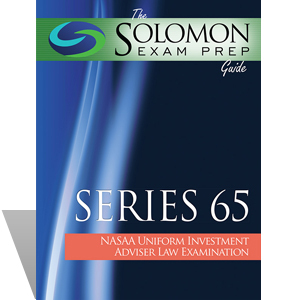 The Solomon Exam Prep Guide: Series 65—Uniform Investment Adviser Law Examination offers a no-nonsense guide to the Series 65 exam. With detailed explanations, visual study aids, and example questions, this Solomon Exam Prep guide will get you on track to passing the Series 65. The Series 65 Exam Study Guide is available as an online digital study manual via your online student dashboard (requires Internet connection/not downloadable) or as a hard copy textbook (shipping & handling will apply). I passed the Series 52 with flying colors using the Solomon program! I used the audio, book, and took many exams. I felt very well prepared going to the test and would recommend this program to anyone! Thank you Solomon! You helped me pass the 6 with a 90%. Would recommend this to anyone! Material is fantastic! I'm getting the 63 to help me pass too!